The paper, entitled “Exosomal PD-L1 contributes to immunosuppression and is associated with anti-PD-1 response” and published in Nature, is a collaboration between Wei Guo, Ph.D., a professor of biology in the School of Arts and Sciences at UPenn, and Xiaowei Xu, M.D., Ph.D., a professor of pathology and laboratory medicine in the Perelman School of Medicine at UPenn. The researchers purified exosomes from a panel of human primary and metastatic melanoma cells lines by differential centrifugation, and analyzed the proteins associated with the exosomes by reverse phase protein array (RPPA) a largescale antibody-based quantitative proteomics technology. 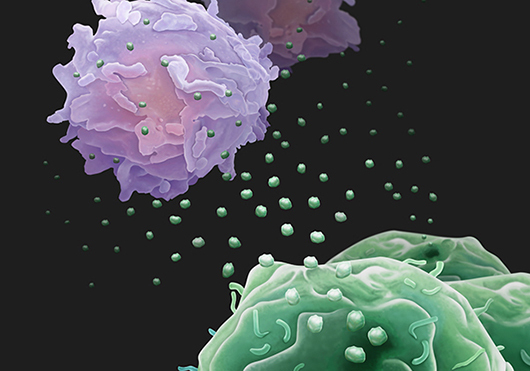 PD-1, found on the surface of T cells, regulates the immune system’s response to cells of the human body acting to inhibit T cells from attacking other cells in the body. However, when PD-1 is bound to PD-L1, the T–cell killing is inhibited. Tumor cells evade immune surveillance by upregulating the surface expression of PD-L1—which, when bound to PD-1 on T cells, initiates the anticancer response (or immune checkpoint response). Checkpoint inhibitors block PD-1, reinvigorating the T cells, and opening up the attack on the cancer cells by the immune system.